Pressure washers make a great cleaning standby. If you invest in one of these for your garden, you really will be able to make light work of any cleaning duties. Whether it’s blasting mildew from your decking, zapping dirt from your patio or hosing down your vehicles, the best pressure washer is a superb addition to your toolshed. The pump of all the products runs at one speed and creates a single water pressure, but you can adjust the stream’s type, pressure, velocity and power by changing the nozzles or wands. Note that if you have a wide spray, the water is at low pressure. If you have a narrow spray, you have high pressure. Sun Joe lets you tailor the pressure output of the spray to your cleaning needs with 5 quick-connect spray nozzles (0º, 15º, 25º, 40º and Soap) that are attached to the trigger-gun. Interchanging the nozzles allow to quickly go from a high-pressure 0° pencil point jet-spray to a low-pressure 40° fan spray, or apply detergent to the cleaning surface with the soap nozzle for additional cleaning power. Sun Joe SPX3000 is equipped with dual detergent tanks . The removable tanks carry and store different types of detergent to simultaneously tackle different cleaning projects. A dial on the unit selects the detergent tank to be used. Sun Joe SPX3001 comes with a 40.6 fluid ounce (1.2 liters) onboard detergent tank. While Sun Joe SPX4001 has onboard 54.1 fluid ounce (1.6 liters) detergent tank. AR Blue Clean does not come with a detergent tank but with a small 14 oz bottle instead. Selection of Low for 1450 PSI & High for 2030 PSI under Pressure-Select Technology. Sun Joe SPX3000 is equipped with a thick “hook” that can be used to hang the rolled up cord. It’s a fact of life. Things get dirty and need to be washed. While you can rely on dishwashers, mops, washing machines and cleaning rags to handle the indoor cleaning tasks, you’ll find that exterior cleaning tasks require a bit more work and time. Outdoor patio furniture, cars, bikes, patios, driveways, and decks can easily acquire layers of dirt, algae or mold. You could try to clean those places with an ordinary garden hose and a heavy-duty scrub brush. But, why not follow the solution that many others have found – a pressure washer. Pressure washers really are a remarkable line of devices which speed up cleaning outdoors while injecting some fun into it and slashing the time you will take scrubbing. Pressure washers come in many shapes and sizes. The first decision you’ll need to make is whether to go for an electric washer or a gas-powered unit. A gas-powered jet washer will give you greater overall power which is superb for heavy-duty cleaning or commercial use. This may be heavy-handed if all you want to do is light household cleaning in the garden. The trade-off is that gas-powered washers are noisy and give off fumes. Although they are pretty bulky, it can be overcome by the addition of wheels or by attaching your pressure washer to a trailer. Think carefully about whether you will cause a disturbance using a gas-powered pressure washer and if you really need all that significant power. If so, go for gas. A much quieter although less powerful alternative is to opt for an electric pressure power washer instead. You will need to be near a power supply and you won’t get the performance of a gas-fuelled monster but, for most home cleaning needs, an electric pressure power washer is the most efficient and cost-effective solution. Electric pressure power washers are made up of an electric motor which runs a trigger-gun type switch, a higher-pressure hose, and a higher-pressure water pump. They connect right into a normal outlet, will be provided with tap water, and also provide water pressure as much as 2,000 psi. Frequently, the water supply is attached to the device utilizing a hose. With different nozzles to manage and vary the water velocity and release through the trigger-gun. Some pressure washers have included the detergent tank, for the detergent to be released with the water stream, enhancing the process of cleaning. Remember that pressure washers are risky devices and ought to be run with due safety instructions. They ought to be held from kids because water pressure close to the nozzle is powerful enough to trigger severe wounds. Although you can buy cordless electric washers, they are much more expensive and you will still be limited by the battery life. For light cleaning at home, electric pressure washers are your best bet. Sure, gas-powered beasts can certainly pack a punch. They are also extremely noisy and can give off fumes. If you don’t need an excess of power, electric is the way to go. For the vast majority of homeowners, an electric pressure washer makes the most sense. Annovi Reverberi (AR) is an Italian high-pressure pump company that’s been around for almost 60 years. AR brings all that heritage to the 383 meaning you can buy in complete confidence. At 1900 PSI, the AR has more than enough pressure on tap on for an electric model. The 11 Amp powerful motor provides amazing power however without having the related noise. With a water flow rate of 1.5 GPM, the AR383 is more than fit for the purpose, you will not get an individual task which the AR383 cannot carry out throughout the home. I have made use of this to clean up the exterior walls, front yard and also my sidings. Almost all these particular tasks need a great quantity of pressure, particularly roof sidings. This power washer comes equipped with an axial piston wobble plate pump. This is appropriate for necessary use around the home. The pump in this unit is attached to the motor that makes it spin faster than a belt driven pump. The 120V universal electric motor will let you take care of our your cleaning duties fuss-free. 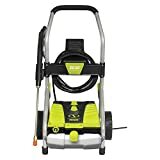 Although you will be restricted to being close to a power supply with an electric pressure washer, you’ll enjoy a generous 30-foot cord to maximize your mobility. Add in a 20-foot hose and you should be able to reach most things you need. You’ll get a nifty accessory kit with an adjustable jet nozzle that can rotate from a wide spray to a pencil-thin spray, depending on what is being cleaned, a foam dispenser and a high-pressure hose. The Total Stop System (TSS) is a superb feature. The rotary nozzle will stop and start as needed automatically. This item weighs approximately 27 pounds, so it is simple to move from place to place with ease. If you are looking for a lightweight residential pressure washer that will help clear your dirty jobs, the AR Blue Clean AR383 is well worth your time. This jet washer is a consistent best seller. Great power output with 1.5 GPM flow rate. Being that this is a small power washer, being able to provide a water pressure of 1900 PSI is incredible. This washer has a two-wheeled trolley and is very light in weight at 27 pounds. This makes the washer to be easily moved in the house with the best maneuverability ever. Leakages: This is the greatest disadvantage linked with this pressure washer. The leakages result because of using a plastic hose adapter to connect the hose to the AR Blue Clean AR383 Pressure Washer. This problem could be eliminated by using brass fittings. Using the hose reel can be awkward for some, the conventional reeling method is very tedious and wastes time. The hose could easily tangle and at times becomes very stiff. We hope you enjoyed our brief review of the AR Blue Clean AR383 pressure washer. If you want the advantages of a quiet, economical electric jet washer then take a good look at the AR383. Keeping your patio and car sparkling clean has never been easier. Snow Joe are an outdoor tool specialist who offers the Sun Joe SPX3000 as part of their comprehensive range. Sun Joe SPX3000 is a great option if you’re searching for a great electric powered pressure washer. The two main things you want to look out for with any pressure washer are the water pressure measured in pounds per square inch (PSI) and the water flow in gallons per minute (GPM). The SPX3000 has the capability to pump out 2030 PSI of maximum water pressure. This is clear that this particular cold-water pressure cleaning device is created for more substantial home requirements. This is a higher maximum water pressure than you’ll normally get with an electric model.The water flow is equally impressive coming in at 1.76 GPM. Since it is electrically operated, the pressure is slightly lower as compared to a gas operated pressure washer. However, this pressure is more than enough to handle the ordinary cleaning tasks. For its small size and sleek design, it packs quite a lot of power.This electric device is powered by a 120-Volt universal single-phase electric motor which pulls 14.5 Amp. It is powered by a 35-foot electric power cord that comes with GFCI safety protection. That provides extra protection against the danger of electrical shock. The electric motor just runs whenever the gun trigger is pushed. This turns off as soon as you discharge the trigger. The SPX3000 boasts an induction motor and a Wobble-Plate Piston pump. These two work together to ensure a smooth and quiet operation. This factor can be quite important in a residential setting with nearby neighbors. At the end of the high-pressure hose, you will find a spray wand and a trigger gun. The spray wand gives you a 34-inch extension to maximize your reach and both can be temporarily and permanently stored in the onboard holder as needed. Changing of the nozzles is simple, and it comes with extra-long power cord and a long high-pressure hose which adds to the flexibility of this machine. You’ll enjoy 5 color-coded quick-connect nozzles with this jet wash. The colors relate to the angles measured in degrees. Angled at 40 degrees, you can get a gentle clean when you need it. 25 degrees caters for most general cleaning duties. If you have a particularly stubborn job, the 15-degree nozzle works a treat. For any awkward and hard-to-reach areas, dial it back to 0 degrees. The fifth nozzle is specifically designed for applying detergent. By attaching one of five nozzles to the end of the spray wand, you will be able to efficiently clean any size area or surface. 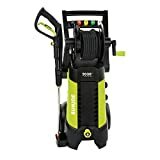 You are spoiled for choice with the Sun Joe pressure washer. The product has duo detergent tanks. It has two 0.9 liter onboard removable tanks that carry different types of detergent to simultaneously tackle various kinds of cleaning projects. This dual detergent tank system is controlled via a detergent selection dial. This allows you to use different detergent in each tank. You can adjust the suction volume of your cleaning solution with a handy dial. Snow Joe LLC includes a needle clean-out tool with their pressure washer. This ensures that the spray wand stays clear of any debris. Storage of this pressure washer is simple thanks to its size of 15.6 by 13.5 by 33.9 inches. Users should note that it does not have a foldable handle. At 31 pounds, it is quite lightweight and can be moved with very little effort. One feature that adds to its maneuverability is its rear wheels. This pressure washer also boasts a Total Stop System (TSS), which automatically turns off the pump when the trigger is not engaged, hence saves on electrical energy and prolong the pump life. With its many safety features, the Sun Joe SPX3000 has been CSA listed and comes with a full two-year warranty. This warranty covers residential use only but includes all replacement parts and repair. Users must ship the entire unit to the manufacturer in order to get a replacement or repairs. Care must be taken to prevent cross-threading when attaching the plastic fitting to the metal pipe and hose. Flush all air out of the garden hose and fill with water before starting the pump. Use the manual trigger to eliminate any minor amounts of air. Use only soap that can be run through a pump in this machine and consider blocking the garden hose opening during storage to prevent small creatures from leaving debris. The SPX3000 comes with a garden hose adaptor (female coupler) to allow easy connection to your normal, outdoor water supply. Users should take care to use cold water with this pressure washer. However, it can handle a water temperature of up to 104 degrees Fahrenheit. The maximum amount of water inlet pressure should be no higher than .07 MPA. Water will run through the pump and out the 20-foot high-pressure hose. This one quarter inch diameter hose can be hung on the side of the pressure washer when not in use. Sun Joe SPX3000 weights at 31 pounds.the unit run smoothly and almost noiseless, except for the water jets when it hits the surface at a very high pressure. With the power rating of over 2030 PSI in water pressure, it surely delivers to the users in terms of cleaning. Many convenient features for its users. Among them are the five spray nozzles, the long power cord and the high-pressure hose pipes adds to the flexibility of the machine. Total stop system for your safety. It offers ultimate safety to the users. The Sun Joe SPX3000 offers the Total Stop System technology which means that in case the trigger is disconnected from hose adapter, it automatically stops the pump. Connections are plastics. Connections to the water hoses are plastic which is not very durable and are at a risk of tending to leak with time. Use of brass fittings would be a better idea. To solve this problem, users have purchased a brass male to the male adapter at any local hardware store. 20-foot hose is slightly limiting. The nozzle cleans a pretty narrow strip of an area and thus one may spend a lot of time when large areas are to be covered. Sun Joe SPX3000 pressure washer is very easy to use. All you need to do is pushing a button to get is started, in contrast to the gas run pressure washers wherever you might experience a few problems with the beginners while beginning. The procedure of this particular pressure washer is self-explanatory, all one requires to perform is to adhere to the easy methods in the user manual to run this even though you may not you are a newbie. 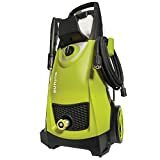 This pressure washer is very light in weight, coupled with the two wheels, its portability has highly been increased and is capable of accessing every corner of the house. It is very simple to change the nozzles; it has an extra-long power cable as well as a long high-pressure hose adding to its flexibility. With such a very long power cord as well as pressure hose, it is very simple to carry out cleaning operations in the backyard as well as the driveway.The Sun Joe SPX3000 is powered using a powerful 14.5 Amp 1800 Watt electric motor which makes it deliver the required amount of power. The motor used reduces the noise levels dramatically making this pressure very quiet and can be used almost everywhere. Powered by the electric motor, this pressure washer delivers a very powerful jet of water at a pressure of 2030psi (pounds per square inch) as well as 1.76 GPM. AR Blue Clean AR383 pressure washer is light-weight, combined with the two wheels; the ease of mobility has extremely been improved and is effective at being able to access each and every part of the home. Starting up this machine is very simple and only involves pushing a button. This is quite simple to alter the nozzles; this has an additional long power cable and also an extended high-pressure hose contributing to the overall flexibility. Having this type of extended power wire and also pressure hose, this is quite simple to perform the operations for cleaning in the driveway and even backyard. 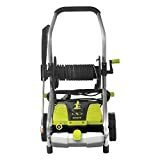 The power used to operate this pressure washer is drawn from a 120 volts, 11-ampere universal induction electric motor which gives it an incredible amount of power. This motor provides a power rating of approximately 1.5HP. Together with the Triplex 3 Axial piston pump; this pump provides all the power you might just need. The motor operates with the minimum noise levels making it perfect for both indoor and outdoor uses. The power given by this washer is extremely high compared to its small compact size. This washer delivers water pressure at a maximum value of 1900 pounds per square inch (PSI) as well as a maximum volume of 1.5 GPM. When compared to the ordinary garden hose, this is roughly 30 times more pressure. For effective high-pressure cleaning, attaching a variable spray lance and switching the spray pattern to a concentrated high-pressure jet from a wide fan by just rotating the nozzles is possible. Use the Turbo Lance for tougher jobs which will effectively increase the cleaning power by around 50% by producing a pulsating rotating high-pressure spray. Sun Joe allows you customize the pressure output of spray to your cleansing requirements with five fast-to-connect apply nozzles which are mounted on the trigger gun. AR Blue Clean 383 arrives with 2 spray wands that may be mounted on the trigger gun. One particular has a moving spray head which can change the water flow through the wide spray to some narrow, powerful spray. Sun Joe is built with double detergent tanks. The detachable tanks can keep and carry different kinds of detergent to at the same time to deal with various cleansing tasks. AR Blue Clean 383 arrives with a plastic bottle that holds 14 oz. There’s no tank for detergent. Sun Joe is built with a thicker “hook” that may be utilized to hang up the rolled up wire. AR Blue Clean 383 is designed with a storage reel. Sun Joe consists of a 34″ spray wand (extension) which connects to the trigger gun. AR Blue Clean 383 arrives with 2 wands with different kinds of nozzles which connect to the trigger gun. Both pressure washers have obtained mainly outstanding reviews from the customers, and although they have some comparable features, they are different in various ways, but at the same time, they are a substitute for each other. First of all, Sun Joe is more efficient compared to the AR Blue Clean. This has a more powerful engine (1119watts vs. 1800watts) and even creates much more pressure of water (1900PS versus 2030PSI). This is built with double detergent tanks to hold and keep different kinds of detergents to at the same time deal with various cleansing tasks. The device chooses the detergent tank to be utilized through a simple switch. There is the Two-year extended warranty in contrast to One year for the AR Blue Clean. These are good differentiators that could persuade you to choose the Sun Joe. On the other hand, AR Blue Clean AR383 arrives with 2 fairly extended wands which connect to the trigger-gun, and one of which features a moving head that may be utilized to modify power and speed of water. A few could find this simpler in this way of handling water pressure in contrast to needing to change nozzles every time water pressure must be modified as needed whenever making use of the Sun Joe. These are two great pressure washers that are powered using electricity. They perform extremely well and have very fantastic features. These pressure washers outdo each other in their different features but are almost in the same class. Different users have different requirements and therefore it is for the users to choose the one that best suits their requirements. The Sun Joe SPX3001 model is supposed to be an upgrade for SPX3000. The technicalities are the same with the previous SPX3000, though, the design changes are obvious. One of the most important features of Sun Joe SPX3001 is the motor. The configuration of 1,800-Watt and 14.5 Amp is standard for the SPX line. All the four models – 3000, 3001, 4000, and 4001 – boast the same motor. Also, this particular electric pressure washer generates a water pressure of 2,030 PSI and a water flow of 1.76-GPM. The SUN JOE SPX 3001 more or less have the same standard features as SPX 3000 beside the hose reel & one larger detergent tank instead of 2 detergent tank. Compare to SPX 3000, SPX 3001 is more about the new design in terms of looks and ease of use. Built on vertical, it weighs 32 lb and measures 14.4 x 33.5 x 16.5 inches (depth / height / width). It also has a pair of 8-inch rear wheels and it has a housing made mostly of plastic. Sun Joe SPX3001 is easy to assemble, using two screws to put together the wand holder and the wand base plate. However, the onboard reel as an improvement is much of a debate between customers. Though the hose is of great quality, it is factory-attached to the unit. A hose as a wearable part, will eventually wear & tear, hence this can be an issue. Replacement of hose won’t be as easy as buying a hose and just screwing it on, furthermore, the water hose connection of the unit, could have used a brass threading instead of only plastic. The onboard hose reel might not improve the ease of use, the vertical design of Sun Joe SPX3001 and this addition from the top make it less stable. Some users prefer not to wind the hose on the reel at all. Others don’t have a problem with winding it but find it difficult to unwind it during use. The lack of stability requires using two hands and maneuvering it too sudden could make it easily tilt and fall. The technical features of Sun Joe SPX3001 overlap the fine line between light-duty and medium-duty pressure washers. Is it significantly different from the previous model? Not necessarily. The main difference between the Sun Joe SPX3000 & the Sun Joe SPX3001 would be the Sun Joe SPX3001 has the hose reel and a singular (but larger) detergent bottle. But that two design element, the onboard reel, & 1 larger detergent tank could make a real difference. To make the call for SPX 3001, you probably have to ask yourself whether you need an onboard reel? The Sun Joe SPX3000 uses two 0.9 liter bottles where the Sun Joe SPX3001 has one, 1.4liter bottle. I fill both tanks of my SPX3000 with the same detergent and prefer manually rolling up the hose & cord. I don’t plan on storing detergent in the bottle so emptying and cleaning the bottle after use would be no problem, and I can’t think of a situation that I would need to use 2 different types of detergents in rapid succession that I couldn’t drain one and refill the single bottle with a different detergent. Everything else looks to be about the same with the possible exception that the 3000 might have a little larger footprint that may make it a little more stable. As far as I can tell, it’s the same thing but designed differently. Same motor and performance. The SPX4001 takes up more floor space, therefore less chance of it tipping over. There are feedbacks & reviews from users who tipped their SPX3000 over since it has a smaller base vs the SPX4001. The SPX4001 has a low center of gravity with its configuration and as such, does not tip over easily during use. The SPX4001 has a high and low-pressure setting whereas The 3000 does not have a pressure setting. You can switch the pressure settings on the SPX4001 to either 1200PSI or crank it up to 2030PSI. The SPX3000 only has it at one setting – 2030PSI. Do take note that, it seems like the newer units with the hose reel such as SPX3001 and SPX4001 use a thinner cheaper hose. If you decide to order an extension hose, get the Heavy duty version. Heavy Duty is what comes standard on the SPX4000. The SPX4001 with hose reel does not come with a Heavy duty hose. It is easier to reel up a non Heavy Duty Hose. The only difference between both units is the hose reel, there’s a hose reel on top that makes it more convenient for storage and ease of use. The SPX4000 doesn’t have one. Given that the whole purpose of a pressure washer is to use pressure to remove dirt and grime, it stands to reason that the most important factor would be to check the rating in pounds per square inch (PSI) to see if the washer you have in mind makes the grade. The maximum water pressure is a critical measurement when you are pondering pressure washers. Anything around 2000 PSI is more than sufficient for home use. If you have commercial usage in mind, look for washers rated 2500 PSI and above for maximum cleaning power.Balance that choice, though, with the amount of water usage per minute. This is measured in gallons per minute (GPM). The more water your pressure washer uses, the more expensive it will be to use it. That said, higher water volumes can also mean the quicker you’ll get your cleaning done. If you plan to clean your car or patio from time to time, ultra-rapid cleaning might not be a priority. If, on the other hand, your pressure washer is for use at work, concentrate on one with a generous flow rate. Nothing is worse than buying a product and then having to figure out how to avoid losing all the accessories that come with it. Being able to store those accessories directly in or on the product itself is a lifesaver. There will be no hunting around for misplaced tools or connections when you’re ready to go to work. Purchase a pressure washer that includes onboard storage for all of its accessories including nozzles, hose and power cord if at all possible. Having a place to temporarily place the hose and spray wand during your power washing is also very handy. Generally, attachments are pretty much interchangeable with pressure washers so you can always add to your arsenal if you feel the need for something extra. The spray wand itself should be as long as possible to give you the highest level of reachability possible. All pressure washers include a spray wand for this very reason, but not all include a trigger gun. Having this extra option allows you to easily start and stop water flow with one hand while perhaps balancing the wand with the other. Remember, there are cheap trigger guns and spray wands and quality ones. Definitely, go for the quality ones in this area.hoses come in many different shapes and sizes. For residential use, a 1/4 inch hose is standard. This is often increased to 3/8 inch on commercial pressure washers to compensate for the increased water flow rate. Plastic is the most common material. If you want a more durable and lighter hose then you can easily upgrade to polyurethane. They are not cheap but can last for years. When deciding whether to go with a spray wand that has one, adjustable nozzle or one that comes with interchangeable nozzles, it is important to consider how much of a range you will need. Many pressure washers come with 4 or 5 nozzles. Do you want to be able to first soak a large area using a wide fan spray and then use a special soap nozzle to apply the soap? Are there tiny areas that will need a very precise amount of water flow? Do you want the ease of just twisting the nozzle to make these changes knowing that with movement comes the possibility of breakage? Or do you prefer to take nozzles on and off depending on your range needs? By using a different angle with the nozzle, you can alter the power of the spray and tailor your cleaning to the job at hand. From 0 degrees for any hard-to-reach areas through 25 degrees for regular cleaning and 40 degrees for a gentler touch, make sure that the model you are looking into has the right nozzles for your cleaning needs. For cleaning cars, a removable but built-in detergent tank is much more convenient than relying on an attachment for your wand. It is also sensible to look for a model with an angled lance so you can reach any awkward areas without breaking your back.Consider the storage of these nozzles. Onboard storage is great, but perhaps having a nozzle that is permanently attached to the end of the spray wand would be better for your needs. A pressure washer is not going to be helpful if you cannot move it to the places you need to clean. It is important to think about who will be using the pressure washer and how far they will need to move it around. For that reason, certainly, consider the weight of the pressure washer. Wheels and handles can help in maneuvering it, but only if they are positioned correctly and are at the right height for use. You also should avoid a product that tends to tip easily if at all possible. Constantly having to go back and stand your pressure washer up is going to slow down your cleaning progress. Size is also an important consideration as the pressure washer must be stored when not in use. There’s no sense in buying a labor-saving device like a pressure washer if it ends up causing you to put in more effort not less. Smaller products will be easier to store, but will not necessarily provide the amount of cleaning power you are looking for. Balance the amount of cleaning power you want with the storage capabilities in your house. Furthermore, remember that smaller sizes often provide more ease in maneuvering the product.Make sure you take your time and buy something weight-appropriate. Being able to load soap directly into a tank and then run it through the machine itself and out the spray wand is surely a nice feature. This allows users to quickly and easily apply soap to the surface in needing of cleaning. That said, if you are only planning to wash some patio furniture and your patio, a nice soapy bucket of water poured over the items in question would suffice. Those washing vertical surfaces such as siding will probably benefit from an integrated soap dispenser. Having a removable storage tank will make cleaning that tank a breeze. Dual soap storage tanks will allow users to apply two different types of soaps for different cleaning needs. A power washer is an amazing tool that allows people to keep their property and belongings in tip-top shape. Cleaning no longer has to be an arduous chore that takes hours upon hours. Instead, users find a pressure washer to be the perfect solution for wetting a surface, applying soap and then scouring away the dirt and grime in very little time. That said, just as no two people are alike, no two cleaning jobs are alike. For this reason, manufacturers have created different size pressure washers with distinctive features and power levels. Consumers should take the time to compare each feature and determine which ones best meet their cleaning needs. So how does the detergent bottle operate on pressure washer? The detergent works by making use of a siphon in the bottle. This particular can siphon out your detergent solution at the ratio of 10:1. This dispenses the detergent solution below LOW pressure, therefore, it is only going to spray out approximately 2 – 3 feet from the detergent bottle. Can an extension cable be utilized with the power washer? Without a doubt, an extension cable may be utilized with the power washer. It should be a high-quality extension cord which will either be 10 or even 12 gauges. As much as 100 feet of 10 gauges may be utilized. There is not any water flow from the spray gun when the trigger is pulled. Do check to find out in case the Safety Lock is in locked/engaged position. There is a black switch on the front side of the trigger of the spray gun. In case the trigger lock is active, then the trigger cannot be dragged in for creating water.